Ever since his feature debut with Violent Cop (1989) 20 years ago, the cinema of Takeshi Kitano has been dominated by the director’s alter ego, ‘Beat’ Takeshi. This is the nickname under which Kitano became famous as a comedian in Japan in the 1970s (as part of a stand-up double act called the Two Beats, so called because of the future filmmaker’s love of jazz music) and thereafter as an infamous radio and television host. It was a convenient means of demarcating a lowbrow celebrity persona from an ambitious and multi-talented creative artist, and Kitano has retained the name for his acting credit in every film in which he has appeared, so that ‘Beat’ Takeshi has become in effect the face of Kitano’s cinema, acting as the director’s surrogate or substitute. As the US critic Kent Jones has noted: ‘the special kick of Kitano’s films… is the man himself. In the distinguished history of actor-directors, he stands alone’. Such is the singular nature of Kitano’s stardom – his (national) popularity as an irreverent television personality against his (international) status as a serious filmmaker – that it should come as little surprise that he has himself recently turned his attention to the specificity of his multifaceted artistry. His last three films, each of which is variously concerned with the theme of substitution, have all been defined by their exploration of aspects of Kitano’s own stardom, or at least critical and popular perceptions thereof. Most recently, Achilles and the Tortoise (2008) examined the artistic face of Kitano and his lack of popular acceptance in Japan through the serio-comic life story of a painter forever out of step with modern trends and practices (Kitano has been an avid painter for over 10 years). Before this, Glory to the Filmmaker! (2007) offered a playful, Fellini-esque satirical vision of Kitano as a director whose career has stalled and who cannot settle on his next project. In the guise of a faux documentary, Glory to the Filmmaker! becomes pointedly concerned with ‘Beat’ Takeshi. Indeed, seemingly unbeknownst to the characters around him, he is sporadically substituted in the narrative by a life-size Kitano doll (replete with puppeteers when necessary), a comedic device that underlines the extent to which ‘Beat’ Takeshi is taken for granted as part of the furniture of a Kitano film. It is, however, the first in this series of what Kitano has self-deprecatingly called his ‘auto-destruct’ cinema that is most thoroughly concerned with the vagaries of Kitano and ‘Beat’ Takeshi, and the particular nature of substitution at their heart. Takeshis’, Kitano’s twelfth film, is given a belated theatrical release in the UK (over four years after its notoriously unsuccessful premiere as the surprise film at the 2005 Venice Festival) and will shock viewers expecting anything like the popular fare of Zatoichi (2003). Indeed, it has been suggested that Kitano acquiesced to remaking Zatoichi in order to gain the leverage necessary for what he knew would be a personal, commercially unpalatable project, having already proposed it (under the title Fractal) as a follow-up to Sonatine (1993), at which time he was strongly discouraged from making it. Takeshis’ concerns a TV star named ‘Beat’ Takeshi who encounters his double in the figure of a struggling actor called Mr Kitano. Over the course of an increasingly surreal narrative, built largely around Edgar Allan Poe’s proverbial conception of life as a ‘dream within a dream’, Mr Kitano begins to usurp the position and status of his more famous counterpart, seemingly becoming ‘Beat’ Takeshi to the point where the line between reality and fantasy becomes ever more blurred and difficult to determine. This most self-reflexive narrative is a culmination of Kitano’s representation of himself, of ‘Beat’ Takeshi, within his cinema, and of its consistent subtext of substitution. This theme is given its fullest expression in Takeshis’, but can be traced back as far as Violent Cop, concerned as Kitano’s first work is with the unmooring of identity in modern, post-economic miracle Japan. The titular detective in this film, as in Kitano’s later international breakthrough film Hana-Bi (1997), moves fluidly from police officer to criminal, one substituting for the other just as the central character in Japan’s other key film from 1989, Shinya Tsukamoto’s Tetsuo: The Iron Man, develops from man into machine. These pictures were made on the cusp of seismic social change in Japan. They appeared just as the death of Emperor Hirohito and the beginning of a recession were transforming the country, substituting an enormously different nation whose points of reference, both spiritual and capitalist, were being increasingly eroded. This sense of identity-in-flux can be seen as a particular facet of ‘Beat’ Takeshi within Kitano’s cinema. In the three films he directed in which he does not appear as an actor – A Scene at the Sea (1991), Kids Return (1996) and Dolls (2002) – the personal trajectories embodied by the youthful protagonists differ markedly. They display ideals of self-betterment through a single-minded commitment (generally to sports; surfing in A Scene at the Sea and boxing in Kids Return) that comes even at the expense of personal relationships. In contrast, the characters played by the director evince no such sense of secure identity developed through action. Rather, like Godard’s outlaw couple in Breathless (1959), their sense of self fluctuates according to each event, with the protagonists’ identity remaining in flux throughout. In Takeshis’, one ‘Beat’ Takeshi literally substitutes for another in a film about internal and external realities, and about the limits of the very notion of existential identity associated with other ‘Beat’ Takeshi protagonists. The point of the substitution in this narrative is specifically to undermine the defining features of ‘Beat’ Takeshi on film, the important detail being that it is the exterior trappings, the accoutrements, of this character that exclusively determine Mr Kitano’s transformation into him. Initially, his rise in status is characterised exclusively by the guns he takes into his possession in order to practise for a film role. He is then further distinguished by his actions with those guns, such as robbing a bank (something that echoes the protagonist of Hana-Bi); and, like almost all Kitano’s characters, by his retreat to the beach. 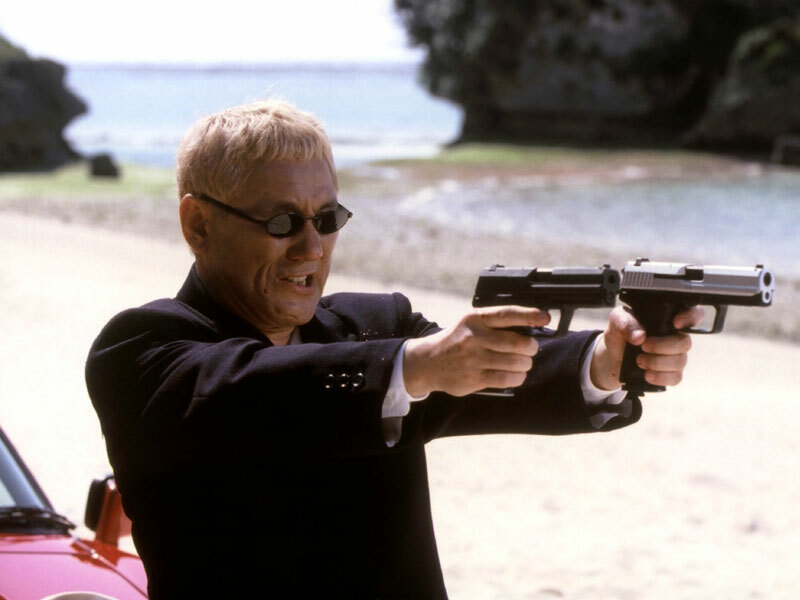 Finally, Mr Kitano’s transformation is crystallised when his body becomes encoded as the cinematic ‘Beat’ Takeshi: that is, when he engages in a prolonged and comically stylised and exaggerated shoot-out against a multitude of opponents amid a veritable hail of bullets, from which he emerges unscathed. In this moment of extreme comedy, Mr Kitano takes on the bodily impenetrability of the typical ‘Beat’ Takeshi yakuza character, and with it his metamorphosis is apparently complete. However, the spectre of (often self-inflicted) death always haunts ‘Beat’ Takeshi’s cops and criminals, and here the notion of encoding the body, of make-up and performance, is explored thematically as the essence of substitution. One possible starting point for the dream structure of the film is ‘Beat’ Takeshi falling asleep as he has a yakuza tattoo applied in preparation for a television role. It is returned to later as Mr Kitano, now fully ensconced as a ‘Beat’ Takeshi clone, stabs the TV star, and the knife in the attack becomes the stabbing needles of the tattooist as ‘Beat’ Takeshi wakes from a dream. In other words, the violent attack by Mr Kitano segues into ‘Beat’ Takeshi being made up (constructed, created, encoded) as the genre figure that he is popularly or primarily known as, with Kitano juxtaposing actual and figurative violence in order to illustrate the harm this figure represents for his career. It is thus redolent of the brutality inflicted on Kitano by commentators who can’t see past violence as a defining feature of his work, who have over-valued and fetishised it out of proportion (the specific parodies of Hana-Bi and Sonatine underline this notion). The theories of the French philosopher Michel Foucault argue that the human body can be regarded as a surface for writing, as a site on which social systems of regulation and control can be marked out and openly displayed. In Takeshis’, ‘Beat’ Takeshi becomes just such a vessel. The yakuza tattoo literally inscribes and codifies his body, just as the views of critics and commentators have figuratively performed the same act of violence against his work, his textual body. From what is, in actuality, a sign of imagined completion and belonging to a bigger body, that of the strictly ordered brotherhood of the yakuza, this image becomes, for ‘Beat’ Takeshi, a stain on his identity, an exterior mark of interior decay. Doppelgänger fiction has been reasonably prevalent in Japanese cinema. Akira Kurosawa’s overt substitute narrative Kagemusha (1980), Shinya Tsukamoto’s Gemini (1999) and Kiyoshi Kurosawa‘s Doppelgänger (2003) are only the most evident examples predating Takeshis’. Kitano follows Akira Kurosawa and foregrounds the subtext of substitution as it is inherent in a majority of doppelgänger narratives (not only cinematic: Dostoevsky’s The Double, Nabokov’s Despair and José Saramago’s The Double are all about the terror of an individual replaced in the world or the potential liberation of replacing someone else). By relating the idea to his own work and screen image, Kitano introduces the idea of performance and the commodification of the artist – the promulgation of copies or clones that take on their own life in discourse on art and the artist. Like Orson Welles’s art forgery essay and magician’s fable F for Fake (1974), in which the director derides the status of art in the marketplace as an entity given a seal of originality and commercial value by bearing the approved stamp of its artist creator, Takeshis’ sees Kitano lamenting the brand he has become. It imagines, in the aforementioned knife attack, the violence inherent in the substitution of an artist with his/her creation, but also the ease with which this can happen: ‘Beat’ Takeshi over Takeshi Kitano. This article was first published in the summer 09 issue of Electric Sheep Magazine, which explored the idea of substitute in cinema.